we are "giving thanks"! November is traditionally the month we remember & acknowledge how thankful we are for the blessings we have. Thanksgiving is the big finale! Here we are kicking it off!!! I have loved using all my fun little My Paper Pumpkin stamps on projects other than the originals! Here, I used the little leaves from the October kit. They are perfect for anything fall!!! My goal here is that they look like they are falling in front of the wall! Kinda works I guess! The pumpkin is from that stamp set too! 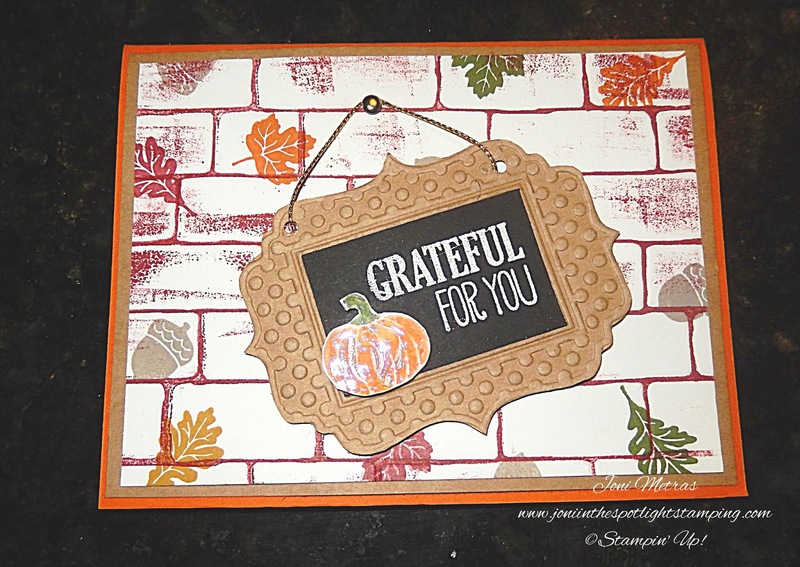 I love this Brick Wall Embossing Folder! It's the perfect background! Here I highlighted the "lines" or cracks in the wall to make it stand out! White Embossing Powder give it a "chalkboard" effect! It's just hanging there with a little Brad and some Gold Cording! The sentiment is from my favorite stamp set, For All Things! It's really perfect for any occasion of gratitude!! You see it frequently if you are a follower of this blog! So now go visit Tina's blog & see how she gave thanks with her creation!!! Just click on her name or the ICS badge below! It'll take you right there! Then keep hopping! 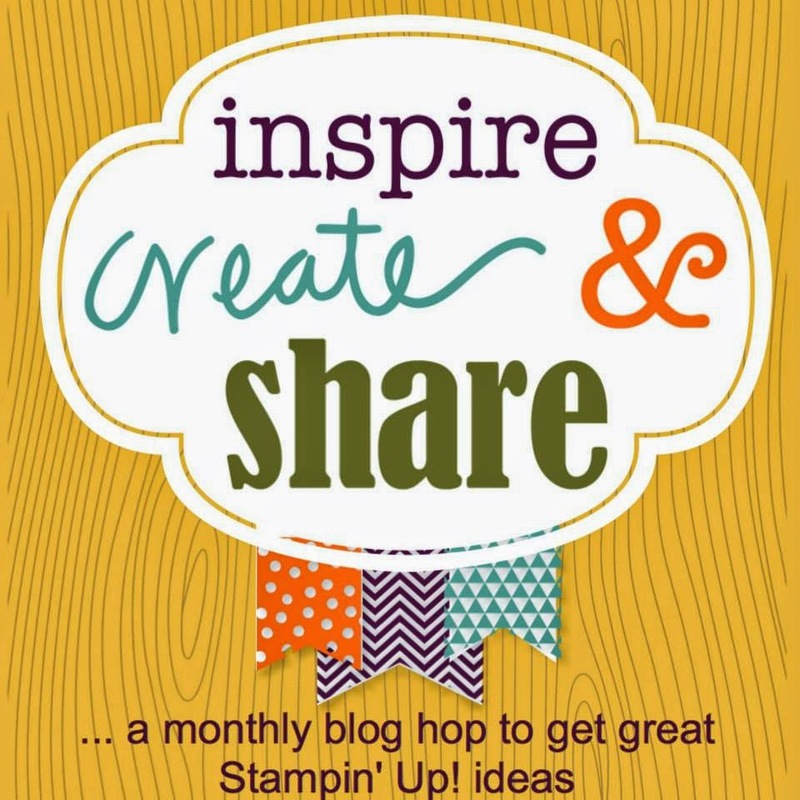 This is a wonderful blog hop and will give you some very creative ideas!!! See you next month! My guess is we will be getting you ready for the Holiday season!!! Cool use of the brick folder! Awesome card! Joni, the sign is so clever! Love it! They do look like they are falling! I love it! I haven't even used that Paper Pumpkin kit yet so I'm about to pull out those awesome stamps now! Great card! Beautiful card Joni! Love how you used the brick folder. Your card rocks, Joni! I love those bricks!!!! Super cute. Love the falling leaves. This is adorable! I haven't seen the brick wall embossing folder used in this way with these colors! Beautiful! What a beautiful card. The leaves do look like they are falling on the brick wall. I love the tag, it looks like a chalk board sign. This is such a fun card! Great job!! LOOOVE the little chalkboard sign! Adorable! This is an AWESOME card! I'm going to have to try that technique with the brick embossing folder. Great job on decorating your brick wall! Your card is so cute! 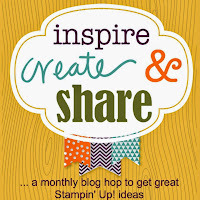 Love that you fussy cut that embossing folder! WOOHOO!!! DID SHE SAY SALE???????? ?